Marv Albert, Reggie Miller, and Mike Fratello commentate an NBA game for TNT. 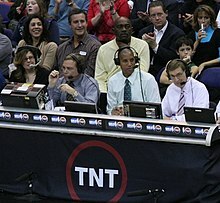 The following people are commentators for TNT's coverage of the National Basketball Association. ^ "TNT's Extensive 2018 NBA Playoffs Coverage – More Than 40 Games – Begins Sunday, April 15, with Tripleheader Action". Turner. 2018-04-12. Retrieved 2018-08-05. ^ "TNT to Present More Than 40 NBA Playoff Games Beginning Sunday, April 14, with Tripleheader Action". Turner. 2019-04-11. Retrieved 2019-04-16. ^ TV.com. "NBA on TNT". TV.com. Retrieved 2018-08-05. This page was last edited on 18 April 2019, at 00:21 (UTC).